‘Pensivity’ is an interactive installation created for the 2014 Beams festival in Chippendale, allowing people to explore themselves with a unique sense of time and space. ‘Pensivity’ establishes a transcendent mirror that reflects the auras of beings that pass by. This reflection is of a temporal nature — as time passes, the energy of visitors disturbs an ethereal space in a playful and mesmerising scene. Our interactive installation builds upon the slit scan cinematic technique by creating an augmented, real-time experience. As the participants move, their reflected human forms escape from rigid skeletal structures and become fluid, twisting and distorting in direct relation to the calmness or energetic vibrancy of their movements. As if moving through water, these new forms affect a projected atmosphere, causing disturbances and creating a push and pull effect between form and environment. When the participants are still, the scene calms and a gentle pulsating energy emanates from within their reflected forms, exploring utopic ideas of peace in both the outer world and the inner mind. 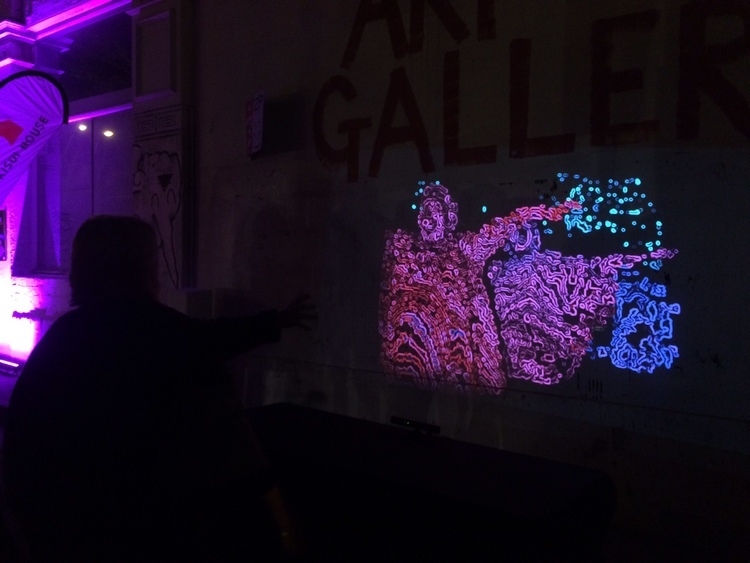 Our interactive installation consists of a large surface projection, reflecting augmentations of people with the algorithmic processing of various camera inputs to establish an immersive mirage. Supporting multi-user interactions in a busy thoroughfare, we aim to create an immersive and serendipitous experience for passers-by and participants of the festival. I personally enjoyed the iterative process taken during this project very much. We had very little time to work on this, but since we started out with a concept that was simple to implement with large potential for growth and had a very flexible visual aesthetic - we could continuously develop the concept, experimenting with new techniques and visuals that were inspired by each agile iteration without being tied down with any initial high fidelity assets. An early implementation of background subtraction, this turned out to be unnecessarily heavy for our use-case, so in the end we simply replaced this with a depth threshold. A depth-based vertical slit scan.